Colette Heaney and Cameron Teggart are celebrating success after winning top awards at the Ulster University Business School. Colette, a former pupil at St Mary’s High School, Newry and a recent graduate with a BSc Hons degree in Marketing, won the Belfast Telegraph Digital Award for Excellence. BSc Hons Business Studies graduate, Cameron, who was a pupil at St Patrick’s College, Knock, was presented with the Belfast Telegraph Award for Excellence for being the best marketing communication student. Lucy Dougan (pictured centre), Marketing Manager, Belfast Telegraph, presents the awards to Cameron Teggart and Colette Heaney. Jeff Kearon, a former pupil at Royal and Prior School, Raphoe, is also celebrating success after winning three major awards at Ulster University Business School in Belfast. 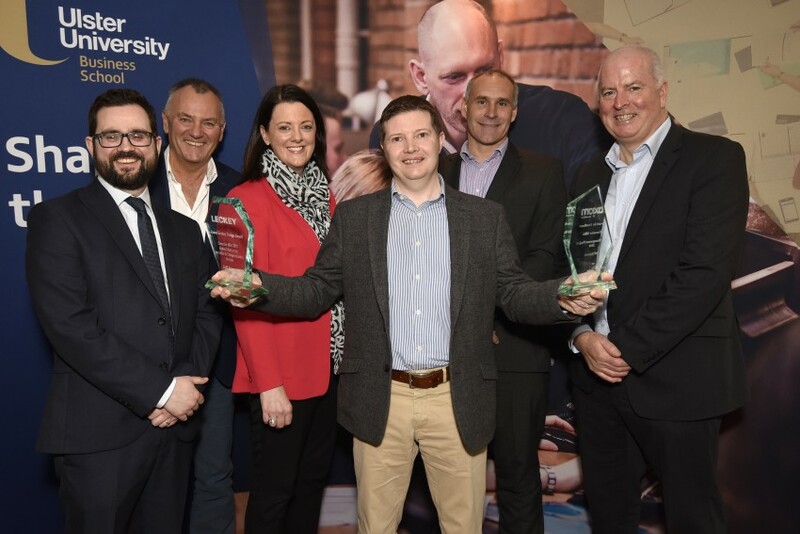 Caption - Jeff Kearon (centre) is presented with his awards by (from left) Mark McCrory, Ulster University Business School; James Leckey, James Leckey Design; Karen Hoey, CBI; Christopher Sonto and David McAlindon, Axiom. Jeff, who has recently completed an Executive MBA, won the CBI Prize for producing the best overall project; the Axiom Prize for being the best overall student and the James Leckey Design Award for achieving the highest mark in the Innovation and Entrepreneurship Module. The awards were presented at the Class of 2018 Excellence Awards organised annually by the Department of Management, Leadership and Marketing. A total of 28 awards were presented. Sponsors included Axiom; Belfast Telegraph; Capita; Chartered Accountants Ireland – Ulster Society; Chartered Institute of Management Accountants Ireland; Chartered Institute of Marketing; CBI; Deloitte; Envision; First Trust Bank; Grafton Recruitment; Hastings Hotels; James Leckey Design, Labour Relations Agency; Lynas Foodservice; Marketing Institute of Ireland; Momentum Human Capital; Moy Park; Peak Discovery; Pure Running; Shredbank; Whale; Wrightbus; and Ulster Sports Academy.